» Kuparuk River 2005 summer temperature and discharge calculated from stage height. Discharge was measured several times throughout the summer using a SonTek Flowtracker ADV and wading rod. The stage height was measured at the time of discharge measurement. Continuous stage height readings collected on an hourly basis were then used to calculate continuous discharge using a rating curve for each summer. Temperature was also measured by a HOBO sensor near this location. Discharge was calculated using stage levels measured by the Water and Environment Research Center using a rating curve that they developed. Kane, D.L. and Hinzman, L.D., 2013. Climate data from the North Slope Hydrology Research project. 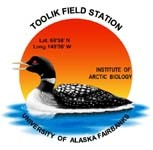 University of Alaska Fairbanks, Water and Environmental Research Center. URL: http://ine.uaf.edu/werc/projects/NorthSlope/ Fairbanks, Alaska, variously paged.